Our programs are structured to allow students great flexibility in the design and direction of their own studies. To keep pace with the latest developments in technology and teaching, our curriculum and materials are regularly reviewed and revised, and our instructors receive further training, as necessary. VIU has seven academic departments offering degrees and certificates in the most in-demand fields. Graduates of the Business, the Computer Information Systems, the Education, the Public & International Affairs, and the Online Education Departments become competitive candidates for employment with top employers in the United States and across the globe. VIU students receive individual attention from distinguished professors who incorporate real-world experience in the classroom. Our small-sized classes, career mentors, and wide range of student activities and clubs allow students to bond quickly, break out of their social and cultural bubbles, and see the world from different perspectives. With students hailing from countries across the globe, VIU offers a truly diverse and international experience. Studying at VIU is a time of self-discovery and broadening of cultural and educational knowledge. VIU students often feel at home while surrounded by our diverse faculty and staff. As a non-profit university, VIU is committed to supporting students by providing low-cost, quality education. With our affordable fees and flexible payment plans, VIU students achieve their educational goals with as little financial stress as possible. A variety of scholarship opportunities help VIU students to achieve their American dreams. VIU's scholarships are awarded on a variety of merits: academic excellence, career growth, special achievements, and many others. Located just minutes away from the US national capital of Washington, DC, VIU provides easy access to historic landmarks, a vibrant job market, and internship opportunities at some of the top US and global agencies. 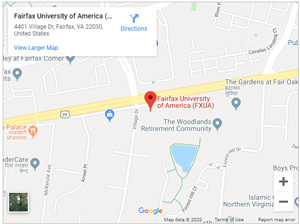 Our main campus is located in Fairfax, Virginia, one of the safest, richest, and most tranquil places to reside in the United States. VIU alumni work for Fortune 500 companies and government organizations including the World Bank, IBM, IMF, Google, and many other multinational corporations. The VIU Alumni Association connects hundreds of alumni around the world and provides exclusive networking opportunities for graduates. Applying to VIU is a life-changing decision and experience. VIU helps students to earn a competitive, American education while providing the most supportive, practical, academic, and professional service along the way. If you are a busy working professional, a stay-at-home parent, or someone who simply wants to study online, we have an option for you! VIU's Online Education Department puts you in charge of your education. The degree you earn from VIU is worth the investment. VIU is accredited by the Accrediting Council for Independent Colleges and Schools (ACICS) to award certificates, bachelor’s degrees, and master’s degrees.